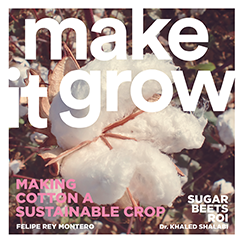 It is a pleasure to introduce you to “MAKE IT GROW”, the new AISco Magazine. This is a project that has been launched to get closer to the global farmers, with the idea of keeping them informed about what is happening in our industry and in our company. We present this to you because it is very important for all of us to share with you our new ideas, our latest products, where we feel the industry is moving to, what are we doing to help you to produce more, and most importantly, using your resources with more efficiency. We hope that everyone really enjoys reading our first issue of “MAKE IT GROW”! !